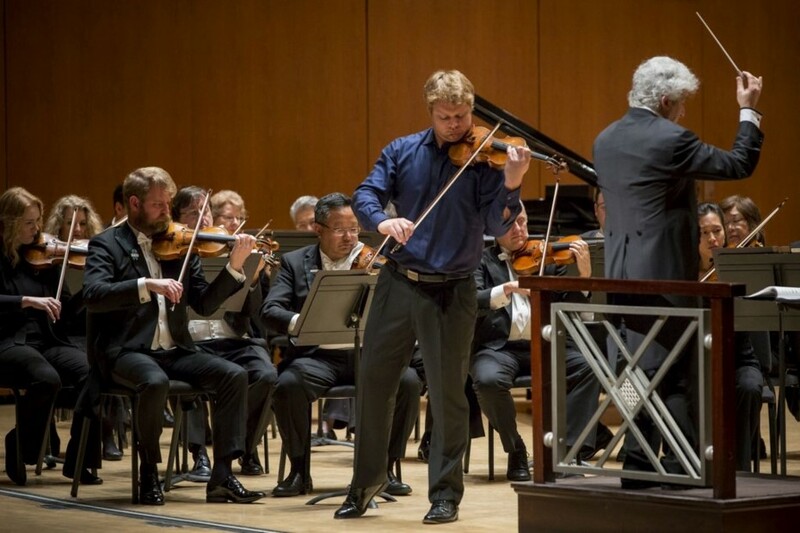 David Coucheron joined Oundjian and the orchestra onstage for the Violin Concerto No. 3. Op. 61, of Camille Saint-Saëns, the last of that composer’s violin concertos, written in 1880. It was premiered by Spanish virtuoso violinist and composer Pablo de Sarasate, to whom it is dedicated, and from whom Saint-Saëns learned much about writing for solo violin. Although its technical demands are less than in Saint-Saëns’ other two violin concertos, it places greater interpretative and expressive demands upon the soloist. As such, it proved an especially splendid choice of solo repertoire for Coucheron, showing vividly how far his playing has come in the seven and a half years since he joined the ASO as concertmaster in September 2010 – at the time the youngest concertmaster among all major US orchestras. While Coucheron’s playing was primarily identified by a notable lyrical sweetness in those earlier years, Thursday night’s compelling performance of this Saint-Saëns concerto showed well the broader expressive and coloristic range that has come to typify his playing today: from a more subtle, multi-hued lyricism to an assured, vigorous sonic presence in the work’s more assertive passages. It was the high point of the evening, surely a bellwether for his future performances as soloist.